The look and feel of the modern dental practice has changed dramatically over the past 10 years. Systems that were once paper-based have now moved into the digital realm. Of the many dental advances over the past few years, there’s no doubt that the technology has been the driving force in this process. First, there’s a big difference between seeing a life-size image, which is around one-inch vs. an image magnified to fill up a typical 17 or 22-inch screen. 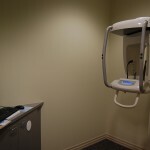 The high definition monitors Forum Dental Group employs, using a high contrast brings out all the subtle shades of gray that are important when trying to diagnose dental decay and other pathology. Secondly, and equally significant, all digital radiography software gives us incredible tools to improve diagnostics. The most popular of these is the capability to alter the brightness and contrast of the image. Other tools that are used at Forum Dental Group include sharpening, smoothing, equalization, inverting, gamma and noise removal. All software also has magnification tools, permitting us to zoom in on key areas of the image. There are a few programs that really simplify this process. We can clearly distinguish between the soft tissues of the gums and much harder tissues of the bones and teeth by applying numerous filters and enhancements to bring out the diagnostic features of the image while increasing diagnostic quality. Improves ability to diagnose disease. Allows for co-diagnosis and increases the patient’s ability to understand their needs.